The Norwegian actress received the Silver Shell for her performance in Swedish director Tuva Novotny’s Blind Spot. Pia Tjelta holding her award in San Sebastian. Photo: Alex Abril, San Sebastian Film Festival. 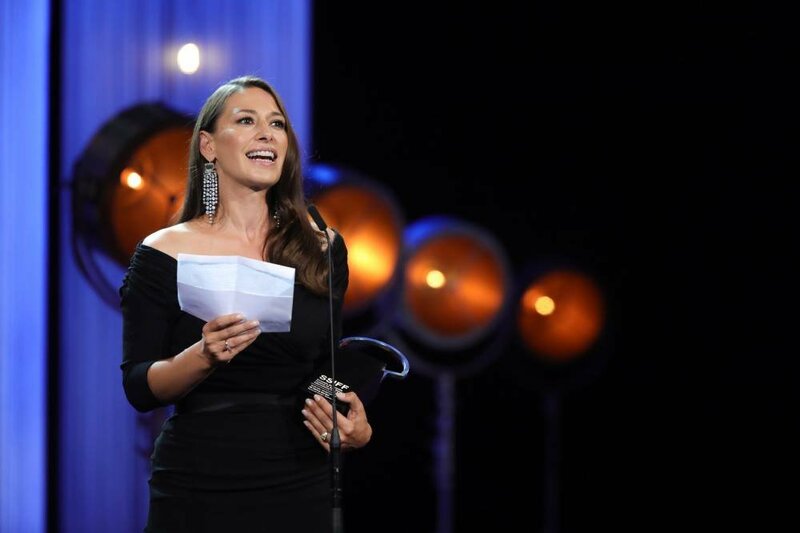 Norwegian actress Pia Tjelta was named Best Actress and awarded the Silver Shell for her performance in Swedish actress-turned-director Tuva Novotny’s Blind Spot (Blindsone) at the 66th San Sebastian International Film Festival, which ended Saturday (29 September). Last Sunday (23 September) she also received Norway’s Wenche Foss Honorary Prize (named after the late actress) for the part; besides Liv Ullmann she is the only Norwegian lead actress honored by the Spanish film festival, which has previously given Silver Shell to actors as Audrey Hepburn, Mia Farrow, Sophia Loren, Julie Christie and Paprika Steen. - First of all I'm quite shocked that this was possible, so I'm almost speechless, Tjelta said of her first international award. - I am absolutely overwhelmed to receive such an award in competition with with actresses I admire so much. Most of all I am forever grateful to Tuva Novotny, who not only gave me this role, but allowed me to participate in a major project related to mental health prevention. Produced by Elisabeth Kvithylll for Nordisk Film Production Norway, Novotny’s first directorial effort – which she also scripted - follows a mother’s struggle to understand the extent of her teenage daughter’s mental illness, which causes a crisis affecting the entire family, living in a society built around happiness and success, where the only projection to the outside world is expected to be perfection. - I am tremendously happy that Pia’s great talent and hard work is acknowledged and appreciated in such honorable surroundings and I am very excited for her great artistic qualities to be recognized on an international level. The fearless devotion Pia brings with her work is a great gift to me as a writer and director and to the film itself,” added Novotny, whose film was premiered on 20 August at the Norwegian International Film Festival in Haugesund. Since her local breakthrough in Norwegian director Arild Østin Ommundsen low-budget drama-comedy Mongoland (2001), Tjelta has worked on stage and screen. She is currently a member of the ensemble at Oslo’s Nationaltheatret, and she has a major part in Norwegian directors Petter Næss and Pål Jackman’s new television series State of Happiness (Lykkeland) which Maipo Film has produced for Norwegian pubcaster NRK.